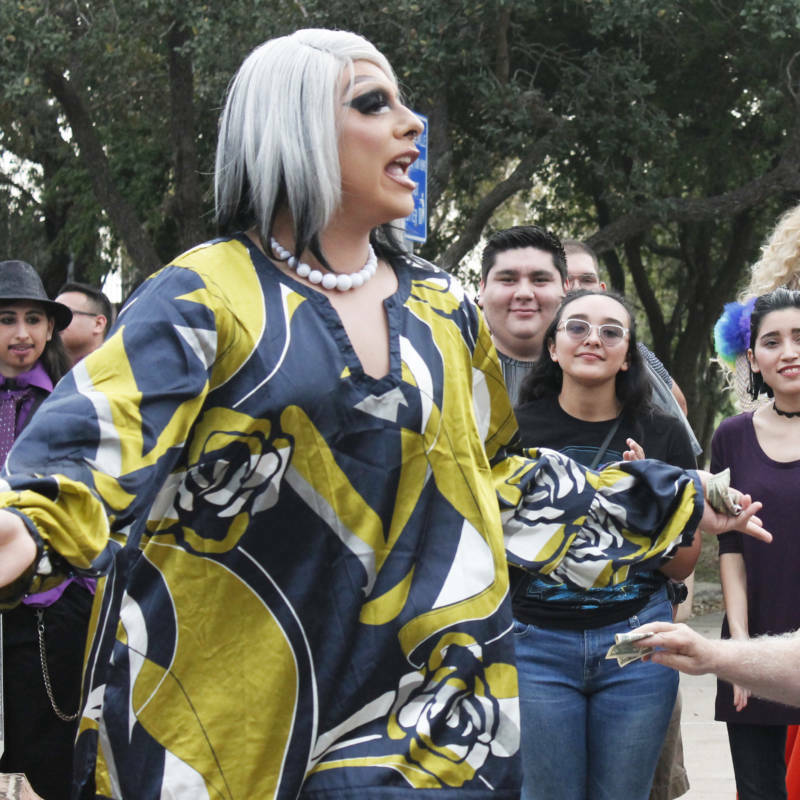 Drag queens from throughout Texas' Rio Grande Valley gathered last weekend in Brownsville to protest further construction of the border wall and bring attention to LGBTQ migrants who have been detained or are seeking asylum. "Who's ready to have a political time?" Lestrange yelled out. The audience, standing in a semicircle and dressed in similarly vivid outfits, cheered and applauded. 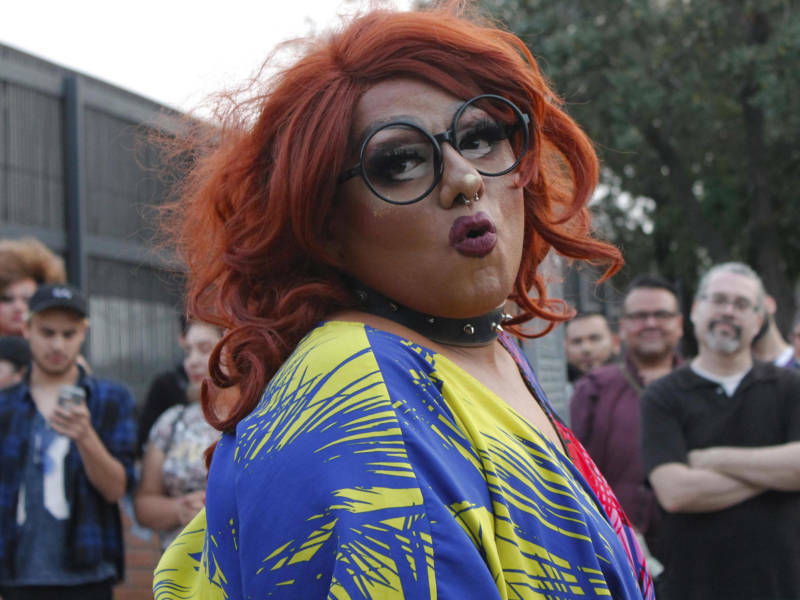 "We'll try to bring joy, positivity, beauty, drag, culture to whatever this is," Lestrange said, pointing to the section of the border fence directly behind her. Earlier this month, Congress passed a spending bill that will allocate $1.375 billion for the construction of border infrastructure in Texas' Rio Grande Valley. Last November, U.S. Customs and Border Protection, in partnership with the Army Corps of Engineers, awarded two contracts for the construction of a border wall in south Texas. Construction is expected to begin this month. Lestrange organized the drag queen protest show and is a self-proclaimed "dragtavist" — a drag queen committed to social activism. "The vision was to perform in front of this wall and project our beauty and our glamour and our empowerment against this symbol that stands for hate, racism and xenophobia," Lestrange said. "I know his struggle coming over and how he built himself from the ground up with his third-grade education," he said. "There are other people who are trying to come over here and do something better for themselves and their families — my dad being one of them — and these other people as well, so they should get a chance to live here also." The queens also sang as part of the event, including Green Day's "American Idiot" and Lady Gaga's "Born This Way." "We get painted as this one negative picture," the performer said. "We are just like any other community, and it's extremely family oriented, it's lovable, humble and welcoming." "We need to continue that movement and let people never forget that there [has] never been a more perfect opportunity to be Valley proud," Trujillo said. "I get teary-eyed and emotional every time," she said, "because they're already fleeing really horrible conditions. They're fleeing homophobia, transphobia, violence, trauma, only to come to the doorsteps of our country and encounter more of that." "If we can do this in front of the border wall, then they can do something similar," Lestrange said. "Do it now because tomorrow is too late."